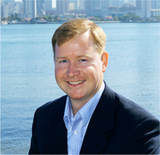 Peter C. Thoms, CFA, is the founder and managing member of Orion Capital Management LLC. He founded the firm in April 2002. Prior to founding Orion, Mr. Thoms was Co-Portfolio Manager and Research Analyst in New York City at PIMCO Equity Advisors, L.P., a unit of Pacific Investment Management Company LLC (PIMCO) of Newport Beach, California. From 1999 to early 2002 he was a Research Analyst for both the $1.5 billion PIMCO Growth Fund, a large-cap growth mutual fund, and the $1.5 billion PIMCO Target Fund, a mid-cap growth mutual fund. In the later half of his tenure he was also the Co-Portfolio Manager of the PIMCO Growth & Income Fund. Before joining PIMCO, Mr. Thoms served as Investment Analyst at Federated Global Investment Management, the New York City-based global investing unit of Pittsburgh-based Federated Investors. He analyzed investments for the Federated Global Equity Income Fund, the Federated World Utility Fund, and two pension accounts that were benchmarked against global equity indexes. Mr. Thoms holds the Chartered Financial Analyst® designation and is a member of the CFA Institute. He earned his Master of Business Administration degree from the Darden Graduate School of Business Administration at the University of Virginia in 1998, and his Bachelor of Arts degree in International & Comparative Political Studies from Hamilton College in 1989. From 1989 to 1993, Mr. Thoms served as a U.S. Naval Flight Officer aboard the P-3 Orion, an anti-submarine warfare and surveillance aircraft. He was stationed at Naval Air Station, Barbers Point, Hawaii and completed deployments to the Persian Gulf in 1990 and to Japan in 1992-93.